This morning I managed to successfully talk myself out of attempting to sew two new dresses before next weekend. It was no small feat as it’s always in the last month or so of winter that I start dreaming pretty hard of spring and summer and I start shopping for a piece or two to add to my warm weather wardrobe. This year my goal is that instead of buying that new dress or two, that I sew them. You know, I want to actually do the thing I keep telling myself year after year that I’m going to do, but never get to. This year I have the patterns and I’ve already started printing and cutting out said patterns. I’ve got a stash of fabric I actually really, really like and most of the thread I’ll need. The sewing area in the basement was tidied during our staycation last week. All I have to do is figure out a chair and set up the ironing board. I’ve never been so ready. All that said, after I’d printed out two new patterns this morning, I came to the cold, hard realization that I’ve got a number of works in progress and before I take on more projects and make a mess in a new area of the house, I really need to trim that WIP list down. Additionally, the original idea to make the deadline that I finish two dresses by next Saturday was a little outlandish. I’m not a very speedy sewist and the idea of setting a goal that pushes me time-wise seems wholly unwise. I’ve always made sewing projects something I need to rush through and the whole point of the sewing area is to alleviate that urgency in the process so it might be more enjoyable. Apply brakes… now. Yes, well, I have not yet started plying these. That needs to happen. 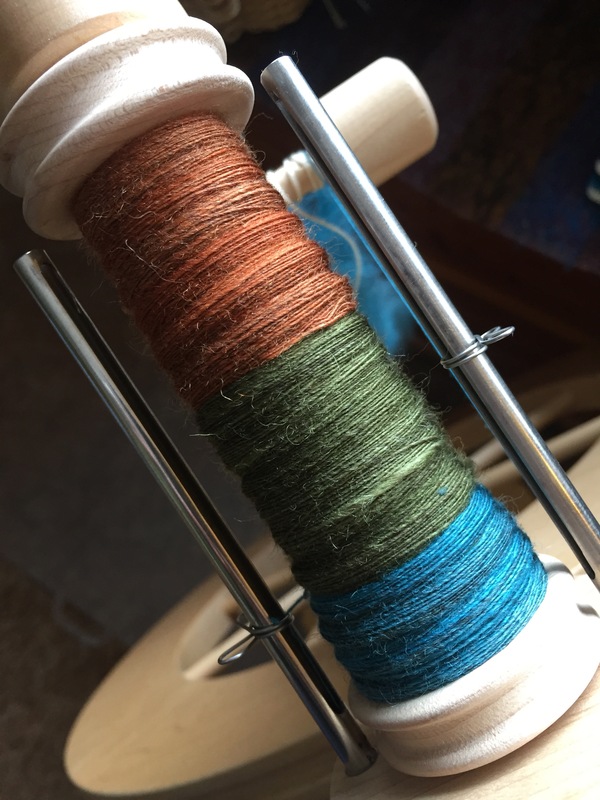 And before I can ply, I need to wrap up my last singles spin…. I’m about one-third of the way through the second 2oz of this project. 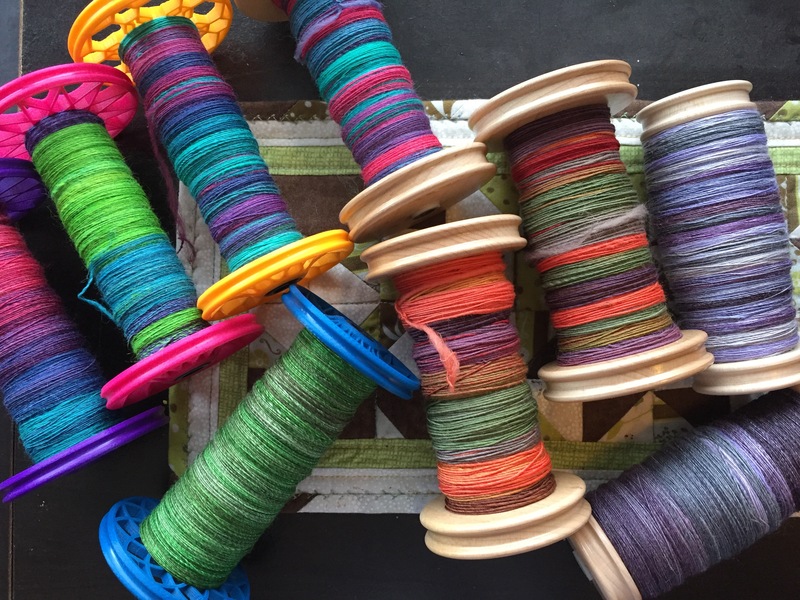 It shouldn’t take too long on the Very Fast Flyer, but still it needs to happen so that I can start the plying extravaganza. This is a Yarn Optimizer knitted in my own Three Waters Farm handspun yarn. The photo is deceptive as it’ll eventually be blocked out into a rectangular cowl — you’ll see, it’s going to be very cool. As we’ve been working on getting back on track with our menu planning and cooking from the pantry instead of the processed heat & eat meals we’d been defaulting to with the busy holidays, I’ve been spending more time in the kitchen and thus my kitchen spinning has come back into play. 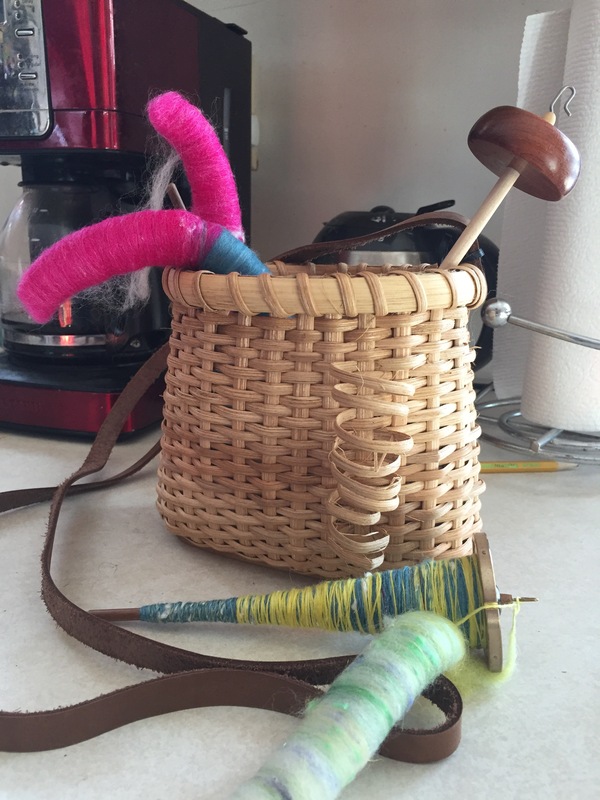 My friend gave me this awesome little spindle basket that I’ve learned to keep stocked with a spindle project. She got it for me with the idea that I could use it on the trail or when I take the kiddos outside in nice weather to run around. I’m sure I will use it for that also, but it’s perfect for this purpose, too. Kitchen spindling might sound a little weird, but I’ve really come love it since taking up spindling more seriously last year. My hip makes transitioning from sitting to standing painful sometimes, so I often just choose to remain standing if I might have to be up & down a lot. Spindle spinning is the perfect solution for me as I wait for a tray of cookies to bake or the potatoes to boil. It’s quiet & meditative & passes the time and it’s easy to set down and pick up as timers go off and other things need attention. I don’t know if kitchen spindling is a thing out there that normal people do, but if you’re a spindle spinner I highly encourage you to keep a kit in your kitchen. I think you’ll love it! I picked this yarn up over the Thanksgiving holiday at Spin of Door County thinking I’d make some socks for my daughter. Instead, I’m using the yarn pour moi (shhh! don’t tell!). I can sense they will be very addictive. I’ve so been in that potato chip knitting kind of mood lately and these fit that perfectly. When I write it all out, it doesn’t seem so overwhelming. So maybe I can treat myself to one sewn dress? I suppose we should see how the day (and the coming week) shapes up. The good news is I’m poised to make a real go and that summer wardrobe and, as always, there’s not a shortage of works in progress around here. I’ve always thought it was completely OK to have a sewing mess, a knitting mess and a spinning mess. That way, no one craft has the responsibility for messing up the whole house. They can share the work. Lovely projects! Well, I wound up cutting out one dress after posting. 😂 I just couldn’t help myself! Wow! I am amazed you have so many projects, hobbies and still raise a family. Do you sleep? I took a class to learn to weave and really want to work at it, but I’m so addicted to knitting, and think that weaving is going to get in the way. Also, want to do some of my stained glass, but again, knitting takes precedence. Love your spinning! The colors are awesome. I do sleep! I stay home with my two kids as we are a homeschooling family. I have a lot of little moments throughout the day and that’s where I get the bulk of my crafting done — 5minutes here and there. I do also knit and spin most evenings after school hours. I just tend to ebb and flow between the different crafts. It works for me! You seem to be a very organized person and are very good at utilizing those small moments of time. You are fortunate, a lot of people cannot do that. I think it’s a product of staying home with the kids. I realized early on I’d only get to do things for *me* if I take advantage of those in-between moments. I’ve been honing those skills for 11years and counting! I am glad to read that you cut out one dress. I think it never hurts to have some variety in the crafting realm. You can work at the sewing a little at a time, especially now that you can leave your machine set up. The dresses will happen almost on their own that way. Kind of like spindle spinning and sock knitting. 😉 I can’t wait to see wgat happens when you get plying, though! You are going to love having all that yarn and all those empty bobbins in just a few days! Yes, yes, yes! I’m on my second last bobbin of plying. Hoping to be finished by the end of the week! I’d love to see the patterns you’re using. 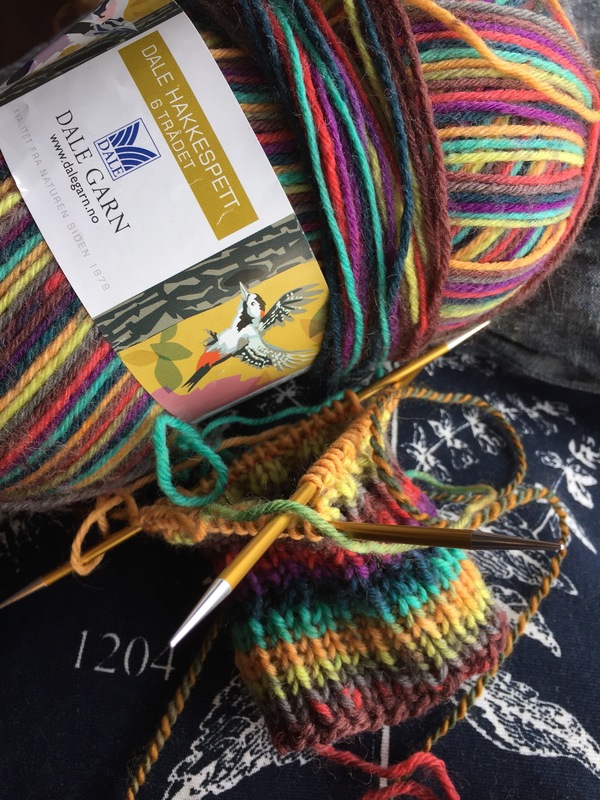 I sewed way before I started knitting – like 49 years before I started knitting! I find sewing to be relaxing but only if I absolutely make myself do everything perfectly – finish all the inside seams which I can use my serger on if I wish and otherwise finish if the serger isn’t appropriate for the fabric. There’s something satisfying about wearing what I make! Currently I have a Gemma Tank from MadeByRae cut out and cut out and starting sewing my first Carson Dress by Paddleboat Studio. I managed to just sew the bodice and sleeves together and walk away. The neckline is next and is the scariest part for me, so I’ll go back to it when I can really focus. I am working on my WIP pile this year too – chip, chip, chip. Lovely yarns happening in your life. Always lovely yarns happening around here! 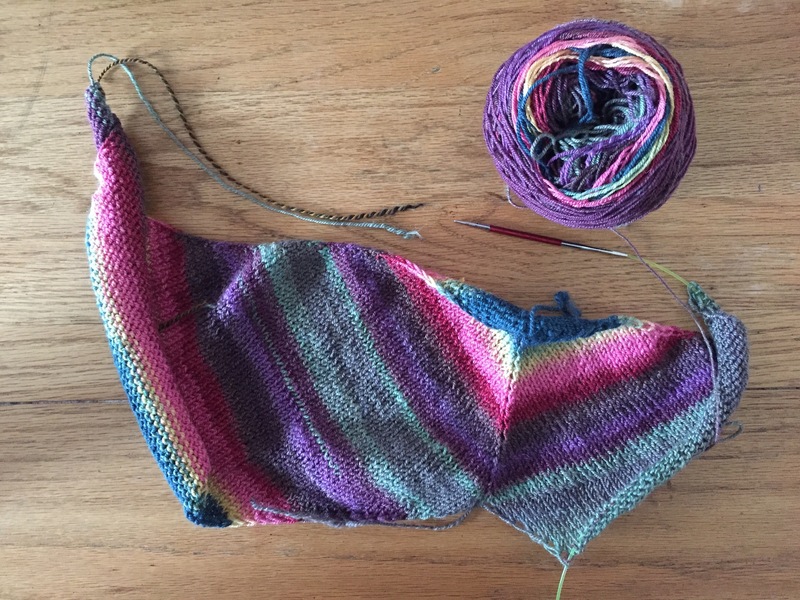 I truly love working through the WIP pile – it always feels great moving projects from the WIP to FO column! WHEW! I’m exhausted reading your WIP’s! Not a criticism, but rather an amazement (is that a word?)! I think when one is creative and knows multiple crafts, it’s easy to get bored – and how cool to have something else to just switch to. My sewing machine is now in the “Yarn Palace” and much easier to get to and use, so I may open it up soon. Re: the right chair – BOY is that important! Make sure the back fits you in the right place and that you can put both feet flat on the ground. With your hip issue, it’s important to be in a good chair that supports you ergonomically. Kudos on all of the ‘lovelies’! We’re exploring lots of options for the chair — everything from bar stools to musicians chairs. We shall see what the “it” chair turns out to be! Wow, that is a great idea! I never thought to keep my spindle in the kitchen; I am always waiting on cookies or tea or coffee and I spindle spin better standing up. Thanks for mentioning this! Oh, I’m so glad it was worth mentioning! I seriously just love spindling in the kitchen. It’s a perfect fit for me — I hope it works for you, too!